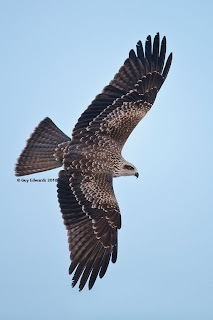 Black kite on video at last.. The Black Kite came around well after I'd put out the food so my chances of capturing the bird on film were far greater than has been the case lately. Due to my feet getting mixed up with the tripod it became much shorter, and much more wobbly a clip than intended, although it does show the bird as made its flight around the feeding area . If the Forecasters are correct, tomorrow is to be a dry and bright day with some sunshine so I'll have a longer lens on the camera and see if I can record a much better clip for publishing on the web. Hundreds of Red Kites are coming in to feed but the Black Kite does show up amongst is larger and more colourful brethren. 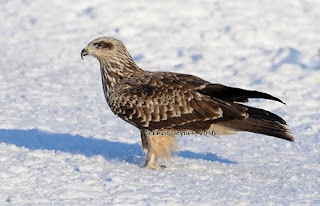 Snow, and yes, the black kite is still here.. Snow has been falling most of the day but its not amounting to much yet. About 1/2 inch was on the feeding field when I went down there today. Its a dark and gloomy day and my attempts to capture a meaningful photograph of the black kite came to nought despite the bird coming around in front of the hides at least 3 times. 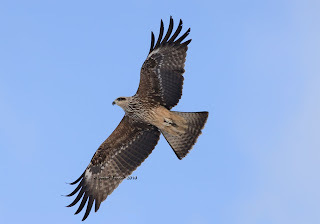 This kite has picked up the methods used by the more seasoned visitors to the feeding area - it is now taking food from the ground at the first attempt and feeding in front of the hides, rather than stealing the fruits of other kites labours. 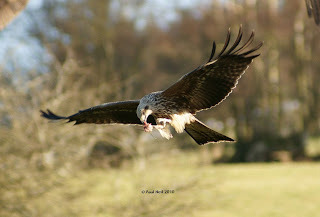 This image of the Black kite feeding was taken by Philip Neale on Sunday. Labels: Rare Black Kite, Snow. The black kite was quite vocal in the morning in a tree behind the house, and put in two appearances at feeding time. I hope to film this bird one of these days. The main problem is that I’m still coming out of the field, having fed the kites, when the first of his visits occurs and so limiting my chances to capture the kite. That has been the single most important thing we have been waiting for lately and we have been able to re-open areas that been unusable this past week. Meat supplies are still problamaticle with half the expected weights being currently available. This has been caused by farms being unable to get stock out during the freeze. Things should get better as the thaw continues. Colin Horlock fed the kites today, while I had a very rare and pleasant afternoon away from the farm celebrating a good friend’s birthday. The Black Kite again made its presence known at feeding time. It is now over ten days since we have had running water in the house and buildings. Somewhere under the concrete and tarmac that make up the farmyards is a pipe full of ice. The novelty of carrying water has long gone. Unfortunately, with the ground still frozen, it could be some time before normal service is resumed. A plan has been made to bring a new pipeline through to the buildings, at a greater depth than those that are frozen, but its time scale is also dependant on the thaw. Building of the new high-level photographic hide will soon commence, and the decision on the site of another public hide is also getting nearer. Clear Roads, & the Black Kite..
Vehicles of all types can now drive to the farm as most of the snow has melted off hard surfaces. There is still ice about the farm but nothing to prevent cars, or folk on foot, from getting about. The kites were slower coming in for their lunch today as the 'pecking order' of adults before young again swung into action. The food has not been lasting much more than 20 minutes these past 4 weeks but with the thaw came a more leisurely approach to feeding with kites still taking food 3/4hr later. The black kite had a good feed again today and even came back for seconds. The photograph on the right was sent me by Janet Baxter. This is another from Janet, and has a Red kite, White Kite, and the Black Kite in view. 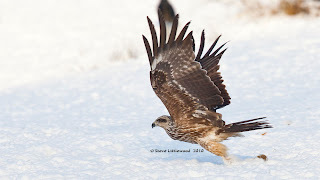 And another from Steve Littlewood has the Black Kite between a couple of Reds. Colin will be feeding the kites for the third day tomorrow (Sunday). 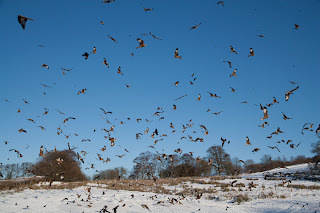 Well, Snow Watch showed 500 plus red kites feeding at Gigrin, yesterday evening, and the web site again lit up with visits from all over the world. However, what was not shown was our visiting Black Kite, which was a surprise as their camera man had the bird in shot on Monday. 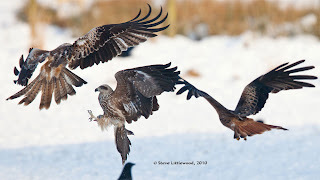 Steve Little provide me with the image on the left - the Black kite taking its prize from our snow laden feeding area. 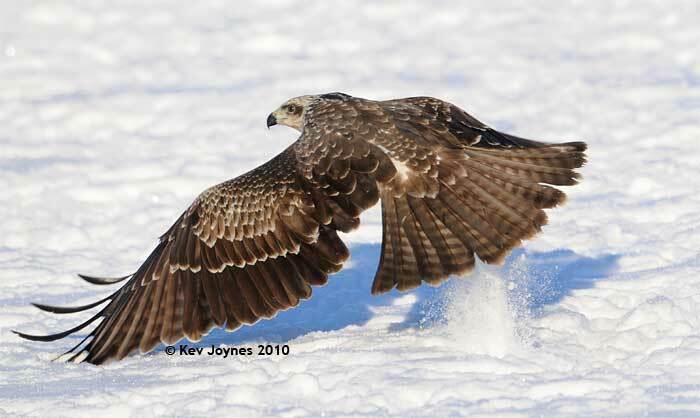 Snow brings its own problems when feeding these birds as the depth means both that the meat would sink out of sight and the kites legs would not reach the floor which means any birds landing would have great difficulty in getting airborn again. 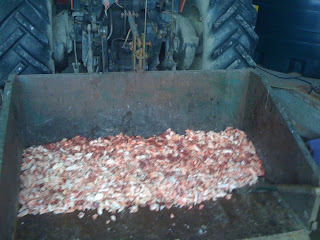 So, the container, which is attached to the tractor, is used to squeeze down the snow in areas on which the meat is to be spread. This allows the meat to scatter across the surface from where it is easily picked up, and any kites that land are also supported. A slow thaw is in progress but we still have a great deal of snow so 4x4s are still the only vehicles that can come up to the farm. The main roads are clear but if you intend visiting in the near future Brynafon Country House offers its large car park to those with more fuel efficient cars. This page will be kept up to date with the road conditions. BBC 2 are screening footage from around the UK on Wednesday evening. 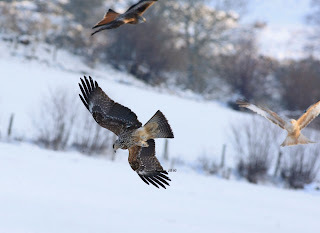 This may have red kites on view..
With well over 500 red kites coming in for food every day it is important to keep up with their needs, and this is possible only if deliveries can get through. Although our road is impassable to trucks I was able to meet our suppler in the town and collect another 500kgs, and another supplier is due to be met on Thursday, so we will once again have a full meat locker. 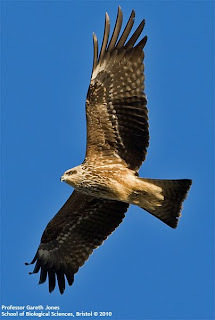 The Black Kite (or is it a Black Eared Kite?) is still here and comes in before I've put out the last of the food. Several photographers have sent me images so a selection are here.. It's snowing again this evening so quite what amount will be there to greet us by morning is anyones guess but the thaw cannot come too soon as the house and buildings have been without water for the last week. Here in all its splendour is the image that everyone has been after. 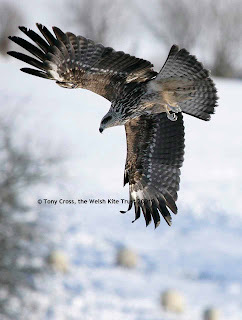 It was not I who caught this kite on the ground but Kevin Joynes, who spent 3 afternoons in the tower hide, before capturing this photograph. I had been in the same hide but was called back to the farm for 1/2 an hour . On coming back I found two extremely happy photographers, who then shared the joy of seeing my face change as they explained how the kite had wheeled around the feeding area before landing in front of them.. Tomorrow is another day, so I'll see if I can get both film, and a photograph the bird. Our drive is still accessible to 4x4s only. Brynafon Country House, which is passed on the approach to the farm, has a large car park and has very kindly agreed to offer this to those who are unable to drive up the hill to the farm. A hot drink and more can be obtained from inside Brynafon. The car park is covered in snow so please drive with care and look to your neighbours when returning to your vehicles. This black kite was here again today and was happy to sit in a tree along side another full of red kites prior to feeding time. Professor Gareth Jones,School of Biological Sciences, Bristol, has very kindly sent me one of his photographs of yesterday. 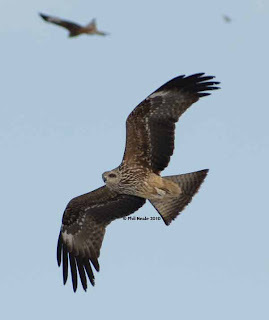 I've uploaded one of my Immature Red Kite images for comparison. 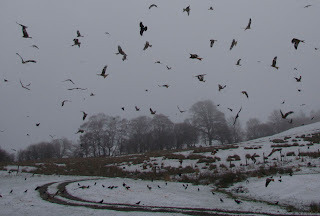 It is snowing heavily tonight yet again so the kites, white, black, and red will be in for their food without hesitation again tomorrow. The main roads are kept clear here in Powys - the council do a great job of coping with winter weather. I can't guarantee that our drive will be passable but Bryafon, which is passed (75m) before the farm, has kindly offered their car park for those without 4x4s. The image on the left was yesterday morning and it was still snowing at that time. It will be interesting so see what we have to wake up to tomorrow morning! That Bird was here again yesterday, and was photographed by many, and seen by even more. It has brought a lot of extra excitement to the Farm. 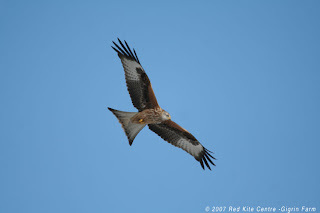 The sun shone, so red, black, and white kites were shown off to perfection. I am waiting for some of those photographs, taken of the black kite yesterday, to land in my inbox. I was busy feeding the birds so did not get an opportunity to capture its image myself. We have about 2" so far, with more falling, and more forecast. The Main roads are passable with care. The stone we had put on our drive has migrated to the centre and sides but this is no bad thing as driving with one wheel on the left of the road gives grip to both wheels right up to the farm. 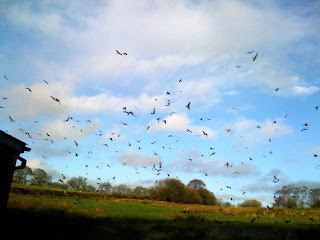 I don't know how many red kites to expect today as there were something at least 500 here yesterday. The kites usually know when bad weather is coming and come in large numbers the day before..
Rare Black Kite at Gigrin Farm! 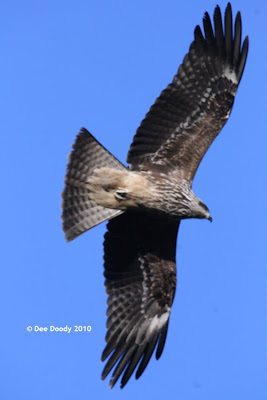 This rare Black Kite was photographed here at Gigrin Feeding Station today 3rd January 2010 by Dee Doody. 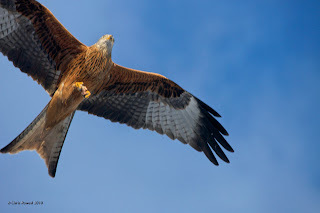 I'd been asked earlier in the afternoon if black kites would be seen and I'd replied 'No, they are not native to the UK'..
We have another red kite in for rehabilitation so the aviary now has 2 red kites and a buzzard to care for. I'll post more news tomorrow.